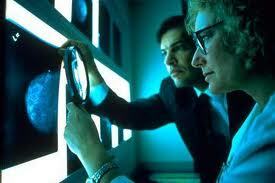 Kaiser Permanente already has the largest electronic medical record system in the world. The Pew Internet Project reported that 40 percent of American adults access the Internet via their mobile phones, and in some cases, mobile phones are their primary source of Internet access. Twenty-five percent of smart-phone owners go online primarily using their phone; of these, roughly one-third have no high-speed home broadband connection. Three months ago, the health care organization announced that 9 million Kaiser Permanente patients now can easily access their own medical information anywhere in the world on mobile devices through a mobile-optimized website. 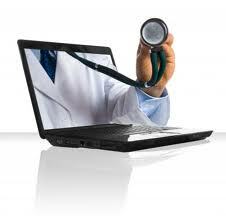 In 2011 alone, more than 68 million lab test results were made available online to Kaiser Permanente patients. 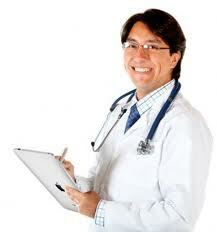 direct and secure email access to their doctors, and will also be able to order prescription refills. 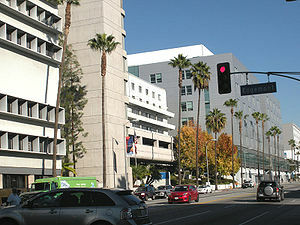 Kaiser Permanente had more than 12 million e-visits in 2011 alone, and they expect that number to rise. The Android app is available now in the Android Market at no charge. Users of other mobile devices can access the same set of care-support tools at no charge through the new secure, mobile-optimized member website, which is available through smart-phone Internet browsers. “This is the future of health care. Health care needs to be connected to be all that it can be. This new level of connectivity is happening real time, and it is happening on a larger scale than anything like it in the world,” said George Halvorson, chairman and chief executive officer of Kaiser Permanente. “Our members love our current connectivity tools,” said Christine Paige, senior vice president of marketing and Internet services. Members using the Android app have access to their kp.org accounts by touching the app icon on their phones. Those visiting kp.org from a mobile phone Internet browser are seamlessly redirected to the mobile-optimized website, which was designed for optimal viewing on a mobile-phone screen. In both cases, a streamlined menu of mobile-optimized features helps members find what they need quickly and easily with minimal taps. “Providing our patients with clear and convenient access to their health information is a step forward in connectivity and improving the health care experience for patients, no matter where they are,” saidJack Cochran, MD, executive director of The Permanente Federation. 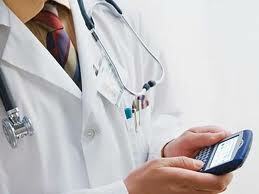 Users’ personal health information is safe and secure while using the new app and the mobile-friendly kp.org, which employ the same security safeguards that protect patient information on the traditional kp.org website, including secure sign-on and automatic sign-out after a period of inactivity. “The benefits of mobile extend beyond member engagement,” said Philip Fasano, executive vice president and chief information officer of Kaiser Permanente. “There has been an explosion in the growth of mobile devices and users are looking for new and improved ways to manage their lives online,” Halvorson said. 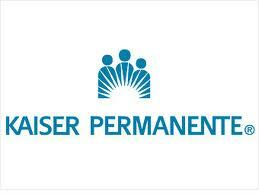 This is a major new connectivity offering, but it is not Kaiser Permanente’s first mobile app. Other, more targeted tools, were released earlier. 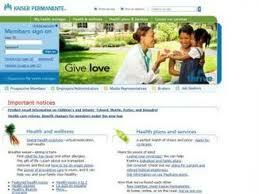 Kaiser Permanente launched its first mobile application, KP Locator for iPhone, in July 2011. The facility-finder app has been downloaded 42,000 times. KP Locator combines the power of kp.org’s robust facility directory and the iPhone’s GPS capabilities to make searching for Kaiser Permanente facilities fast and easy for patients on the go. It answers three of the most basic, but vital, user questions thoroughly and simply — where are the Kaiser Permanente locations close to me, how can I contact and get to them, and what departments and services can I access there? Kaiser Permanente also released its Every Body Walk! app two months ago to help encourage people to walk and maintain healthy activity levels, and that app was rated No. 5 in the Top 100 Green Apps by Eco-Libris. 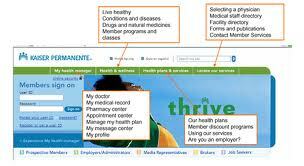 Kaiser Permanente is known for its leadership in the use of health information technology. 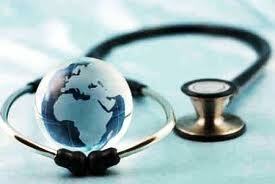 The Kaiser Permanente electronic health record is the largest non-governmental medical record system in the world. KP HealthConnect enables all of Kaiser Permanente’s nearly 16,000 physicians to electronically access the medical records of all 8.9 million Kaiser Permanente members nationwide and serves as a model for other care systems. Kaiser Permanente has received numerous awards for its health IT expertise, including four 2011 eHealthcare Leadership Awards. You can learn more about how patients, clinicians and researchers are using My Health Manager and KP HealthConnect by checking out Kaiser Permanente’s YouTube channel: www.youtube.com/kaiserpermanenteorg. Kaiser Permanente also has what might be the world’s most complete electronic medical library to support its caregivers by providing convenient access to the best and most current medical science. 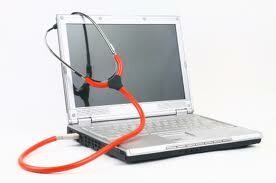 That electronic medical library is for internal use only. Love this gadget. 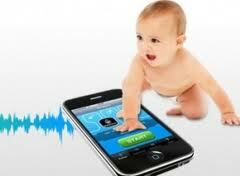 BabyPing recently announced the arrival of its new high security Wi-Fi baby monitoring system. 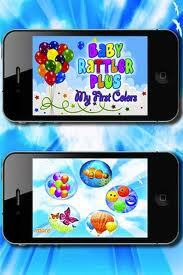 The product will allow parents to hear and view their baby utilizing an iPhone, iPad or iPod touch. The system also features double-layer security that alerts parents if their baby cries, if the Wi-Fi connection drops out or if their iOS device is out of range. The BabyPing kit features all the specifications of a regular baby monitor, in the form of a full color video camera with 640×480 resolution and built-in microphone, a free monitoring app for the user’s iDevice, and wireless Wi-Fi connectivity. In addition, BabyPing has developed the Smart Filter which reduces background noise and static, and Constant-Connect technology which instantly notifies the user when the baby is upset or if the connection is lost. BabyPing is also reportedly the only Wi-Fi baby monitor on the market with infrared night vision. BabyPing will be available from February 2012. Everyone wants a piece of a new parent — or, at least, the wallet of a new parent. Baby Connect, an app for iPhone and Android, showing a graph of a baby’s daily activities. Browse all the mobile app coverage that has appeared in The New York Times by category, and see what Times writers have on their phones and tablets. App stores are part of that money rush. There’s mobile software that can help parents name their babies, soothe their babies, entertain their babies and speak to their babies in sign language. The newest baby app of note on the market, though, WebMD Baby, is free, and it is arguably more practical and useful than many of the others combined. 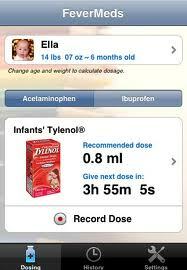 WebMD Baby is available only on Apple devices, at least until the company releases an Android version later this year. It provides a strong complement to — if not a total replacement for — Baby Connect ($5 on Android andApple), the best mobile assistant for new parents. Unlike Baby Connect, whose strengths and weaknesses I’ll detail in a moment, WebMD Baby comes packed with information. 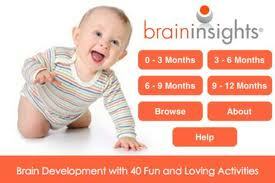 The app takes advantage of its parent company’s trove of medically related content to offer parents guidance on what to expect from their child’s physical and emotional development, as well as health-related counsel when things go wrong. At the app’s core are roughly 400 articles, 600 tips and 70 videos. Oddly, the app doesn’t allow for full-screen video in landscape mode, but since this is a new app, I’d expect WebMD to fix this flaw quickly. Some have criticized WebMD for publishing medical advice that might encourage readers to use its advertisers’ products, but I found the section on “Illnesses and Emergencies” to be generally free of specious advice. For now, at least, there is no advertising on the app. WebMD Baby also has a “Baby Book” section, where you can record and store videos, pictures and notes of a child’s milestone moments. The videos and photos also remain in the device’s photography storage area, so they’re not held hostage by the app. Thankfully, every page is designed in a way that would make it easy for a parent to use with one hand — while, presumably, holding a sleeping baby with the other. One of the app’s shortcomings is that parents can’t peek in on the app from different devices and see the latest information. If you log information into WebMD Baby from aniPhone and then your spouse logs onto the app from an iPod Touch, for instance, it won’t show her the information you entered in the iPhone. With Baby Connect, however, such an arrangement would work nicely. Even if you have an Android phone and your spouse has an iPhone, any time you enter new information into the app, those changes will appear on your spouse’s app the next time it’s opened. Baby Connect lacks the information and advice that makes WebMD Baby so valuable, but it has more tracking options than its competitor. 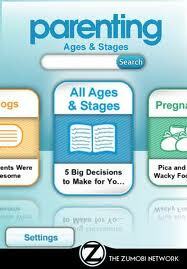 The app prompts you to create a separate page for each child. 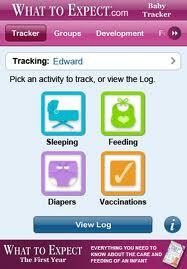 From there, parents and caregivers can track mood and activities, as well as health-related items like vaccines, temperature and medicines. If you’d like to simply remember where you were at a given moment with the baby — so you can remember their first public tantrum, perhaps — the “My Location” button will make a record of it. The app is generally easy to use, and it includes a helpful summary page for each child so you can scan recent entries at a glance. That said, it can be difficult at times to understand the app’s internal logic. Seven main features are included on a child’s home page, including “Medical.” (Additional features are expected in an updated version the company plans to release this week.) When pressed, the Medical button yields a list of items like weight, or vaccines. Alongside those main buttons on the child’s home page is one titled “More,” which leads to another screen of items like nursing, solid food and, again, vaccines. Unlike the vaccine section found through the child’s home page, though, this one includes a list of common inoculations. If you choose one from the list, thereby indicating that your children received that particular vaccine, the app will record the event in the other “Vaccine” location. That’s helpful, but it would be much simpler to offer the list of vaccines in the original “Medical” section. New parents have enough to figure out. They don’t need to add tricky software to the list. 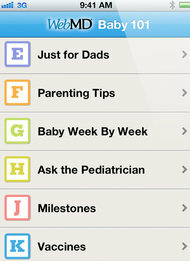 Yet Baby Connect remains a more fully featured app for new parents than WebMD Baby. For people who are approaching parenthood for the first time, and who have a tendency toward extreme organization, Baby Connect is a good complement to WebMD Baby. Otherwise, I’d leave space for WebMD Baby and feel grateful for a moment’s respite from spending money on parenting products. Fans of the comic strip Pearls Before Swine should check out Only the Pearls ($4 foriPad), which includes 250 strips, 12 animated strips and video interviews with the author. … Want a ballpark estimate of your tax refund? Consider TaxCaster by TurboTax (free onAndroid and Apple). … Asteroids Gunner (free on Apple) is a well-executed reprise of the classic Atari arcade game. A version of this article appeared in print on January 26, 2012, on pageB6 of the New York edition with the headline: A Free Source of Information and Advice for New Parents. Dr Weissman is on the Faculty at the Chicago Institute for Psychoanalysis and he is Professor of Clinical Psychiatry at the Feinberg School of Medicine of Northwestern University in Chicago. We now communicate in ways that are very different from those available just a decade ago. 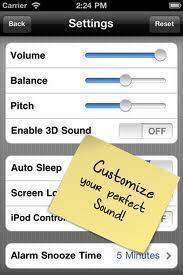 The iPhone, iPad, and similar devices also enable us to observe ourselves as we perform any number of activities. These and other new devices may have an application their designers never considered. I believe we can harness this technology to help us treat some of our patients. Specifically, I propose that the ability of the iPhone and iPad to ”film” ourselves in real time could serve as an important therapeutic instrument in the treatment of patients with anorexia nervosa (AN). We know patients with AN have a delusional sense that they are overweight and have a distorted body self-perception, even when they are undernourished and near death. To address the distorted self-image, we use various medications and forms of individual, group, and family psychotherapy along with nutritional support administered with the help of dieticians. These treatments aim to correct the patient’s delusional perception of body image and to establish life sustaining eating patterns that will maintain body weight. Correcting the patient’s delusional self-perception is seen as critical in the patient developing life-sustaining eating patterns. Over time, and for some patients, however, these treatment approaches have limited success. Mental health professionals typically employ verbal or written communications to address and alter an anorexic patient’s distorted self image. Patients may appear to accept our therapeutic pleadings and go along with varied elements of our treatments. Secretly, however, they often don’t believe what they tell us. Thus, even when we believe our treatment has been successful, seeds of relapse often exist. If we focus on obtaining a better understanding of how patients with AN distort their body image, perhaps we can enhance our therapeutic approaches? If a patient with AN sees her reflection in a mirror, she typically perceives herself as overweight. However, if she is shown an iPhone image of herself immediately after it is taken, I have found that she may see herself differently — in fact, as the undernourished person she really is. When she sees herself in the mirror, the image she sees is instantaniously fused and distorted with her self-perception as overweight. When the same individual holds an iPhone with an image of herself immediately after it is taken, a different cognitive process is involved. First she observes in the iPhone a picture of a woman and that woman’s physical characteristics. She may be able to accurately describe the physicality of the woman in the picture as extremely thin. 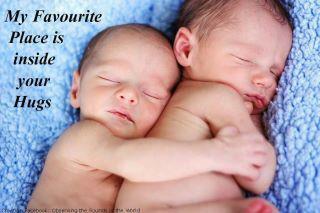 This may occur because thebrain first registers the physicality of the person. 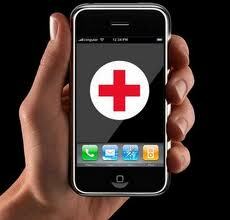 Quickly the patient will realize that she is, in fact, the woman in the iPhone image. At this point, she may or may not continue to be able to report accurately what she now knows is her own picture. The therapist who treats patients with AN can use the patient’s potential capacity to correctly describe the iPhone images to help her correct distortions of body image. Let me describe an approach utilizing this knowledge that has successfully worked with some of my patients with AN. First the patient is asked to observe and then describe her image as seen in a mirror with her therapist present. Then an iPhone image is taken. She is asked by her therapist to describe the iPhone image. If she can correctly describe her physicality in the iPhone image and distinguish it from her distorted view of the mirror image, her therapist can go on to address with the patient her distorted body image. When a patient persistently describes the woman in the iPhone image in the same terms as she does when observing herself in the mirror, the therapist takes a picture with the patient. The therapist then asks the patient to describe separately their images. If she sees a distorted image of the therapist, the therapist and patient then work to develop a jointly shared description of the therapist. Once this is achieved, both re-examine the image of the other person in the phone image. . . the patient. They now work together to develop a jointly shared view of the patient. The therapist does not correct the patient’s misinterpretation of the phone image. If she has correctly described the image of the the therapist but cannot accurately describe her own image, then the therapist may remind her that both agreed on the therapist’s image. At this point, they may again see if they can come to an agreement on a description of the woman in the image. If they now can not, the therapist can explore with the patient why she felt she could not. By reconciling the patient’s perception of herself in the phone image and in the mirror, the patient may actually be able to correct her errors of body image and would — with additional therapeutic interventions to sustain this corrected vision and — eventually be able to maintain her weight with little or no outside help. The additional treatment would also utilize appropriate principles and techniques of Cognitive Behavioral Therapy as well as nutritional counseling. Because of the risk that body image distortion and weight loss will recur, the patient may benefit from learning how to use the selective phone images throughout her life to ensure a reliable body image, regardless of whether she is in therapy. These therapeutic interactions may be a useful facet of a multifaceted therapeutic approach. They are intended to reduce the power of body distortion in perpetuating AN. 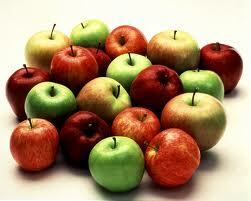 CBT and nutritional counseling continue as important elements in the treatment of AN. The technique to address distortion of body image may also be of use in the treatment of patients with body dysmorphic disorder. 1. Fromm-Reichman F. Principles of Intensive Psychotherapy. University of Chicago Press, Chicago;1950:175. Anorexia is not the disease we’ve always thought it was. It’s not just a psychiatric disorder. Anorexia is a medical illness of starvation that causes malnutrition in the body and the brain. Treatment needs to focus on correcting this malnutrition. 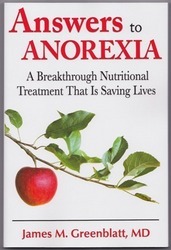 The first thing Dr. James M. Greenblatt wants you to know about anorexia nervosa in Answers to Anorexia (Sunrise River Press, softbound, $16.95), his breakthrough new treatment for treating and preventing the disease, is that this is no trivial condition. The second thing Greenblatt, a noted expert in eating disorders and integrative medicine, wants perfectly clear is that the medical profession has failed the millions of young women—and increasingly men—ravaged by the spiral of self-imposed starvation that anorexia unleashes. By treating the underlying medical illness of brain starvation, Greenblatt has had success in helping anorexic patients recover. Armed with the latest research from the frontiers of brain chemistry and nutrition, he even believes that anorexia nervosa may be preventable. That’s the best news we’ve had in fifty years of treating the disease. Greenblatt’s new nutritional paradigm resulted in his developing a highly accessible treatment regimen incorporating holistic and integrative/nutritional medicine. The nutritional model also enabled Greenblatt to develop a new diagnostic tool for determining the likely effectiveness of individual medications for the treatment of depression and anxiety that often accompany anorexia. Many of the symptoms anorexics present, including ironically, self-starvation, are themselves expressions of a starving brain. A brain that convinces you it’s a good idea to starve is an insidious adversary. Fortunately, as Greenblatt’s research concludes, you can stop this life- threatening process with targeted nutritional interventions. Answers to Anorexia presents these neurophysiological breakthroughs in language accessible to any layman. It’s a fascinating book for anyone interested in the physical damage and brain dysfunction that result from anorectic malnutrition. And a life-saver for anyone suffering through it. Media contact: Victor Gulotta, Gulotta Communications, Inc.
A pioneer in the field of integrative medicine, James M. Greenblatt, MD, has treated patients with complex eating disorders since 1988. An acknowledged eating disorder and integrative medicine expert, Dr. Greenblatt has lectured throughout the United States on the scientific evidence for nutritional interventions in psychiatry and eating disorders. In addition to being the Chief Medical Officer of Walden Behavioral Care, Dr. Greenblatt is the Founder and Medical Director of Comprehensive Psychiatric Resources, a private integrative psychiatric practice. Dr. Greenblatt also serves as an Assistant Clinical Professor at Tufts Medical School. After receiving his medical degree and completing his psychiatry residency at George Washington University, Dr. Greenblatt went on to complete a fellowship in child and adolescent psychiatry at Johns Hopkins Medical School.